When you sell Girl Scout Cookies, you're doing more than just helping your customers stock up on delicious treats (and having lots of fun). You're doing it with a goal in mind. Whether that goal is a pizza party, a community service project, or your first overnight camping trip with your troop, you know how many boxes you need to sell to make it happen. FEBRUARY 2: Cookie Sale Begins!! When a customer purchases 5 or more boxes, you can hand them a card so they can enter our 5 for FIVE contest. Use these at your booth sale to encourage your customers to purchase at least 5 boxes. Grab a box—or two, three, or more!—of your favorite Girl Scout Cookies, then try out these easy peasy recipes courtesy of Taste of Home®. You can make your very own Girl Scout Cookie–inspired masterpiece to share with friends and family. Use this flyer to share with customers who are interested in learning more about where money for Girl Scout Cookies goes, or more about Girl Scouts in general. Hand out stickers to your customers after they have purchased cookies. It will help speard the word that others are missing out on the goods! Use this poster at your booth to advertise to customers that they can donate their cookies to our military troops and Regional Food Bank! 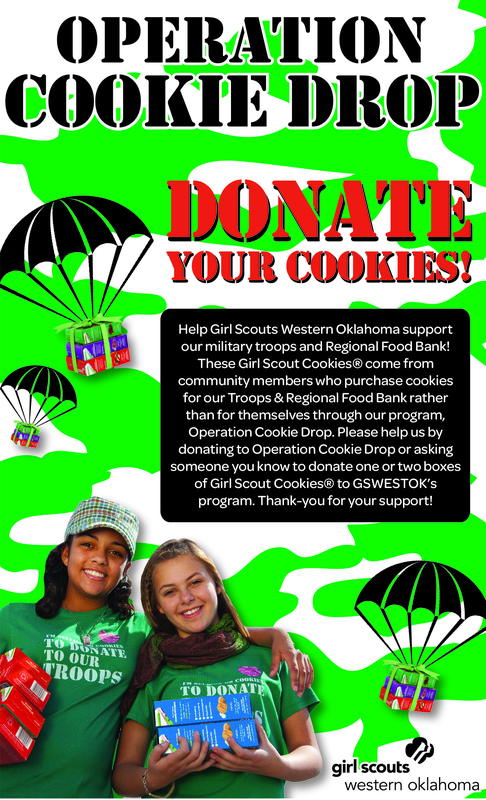 Give a sticker to your customers that donate cookies to Operation Cookie Drop to say Thank You to giving to our troops! Made exclusively for Girl Scouts Western Oklahoma, the local SONIC Culinary Innovation team put together special recipes for us to try out and for girls to hand out to customers! troop/SU incentive card? Click here to find out! Enter now for your chance to head to sunny California! Our incredible Cookie program participants will have the chance to win the Cookie Entrepreneur Experience of a lifetime featuring the the similarly self-starting, passionate, and creative DC Super Hero Girls. They'll also get to meet prominent entrepreneurs, tour Warner Bros. Studios, and best of all, put their I-can-do-anything capes in motion to accomplish amazing things! Use our handy tip sheet and mini graphic novel template to start preparing your entry. Then come back when the contest opens January 2 to submit your entry. Please note that a one-page mini graphic novel is required if you’re a Daisy, Brownie, or Junior, and a two-page one is required if you’re a Cadette, Senior, or Ambassador. Be a registered Girl Scout participating in the 2018-19 Cookie Program, and a legal resident of one of the 50 U.S. states, the District of Columbia, Guam or Puerto Rico, or a resident currently residing in overseas military installations with a valid APO/FPO mailing address. Have a scan or photo of your mini graphic novel ready to upload. Have a solo photo of yourself (from the waist up) ready to upload. Make sure your face is clear and in focus. Have at least 15 minutes to complete your entry (it must be completed in one sitting), and understand that you won't be able to save your entry to finish later. There are an additional set of extra credit questions you can complete if you want to earn extra points. The questions are available through the entire contest, and you're encouraged to answer them toward the end of the sale to highlight your accomplishments.